This page is for the customer who accepted the reservation after confirming the schedule. If you applied by multiple people, please click on the "Add to cart" button, please set the number of people in the cart. Regarding application for Night experience plan, first fill out the form on the "Night experience plen" page, please apply.We will contact you as soon as we confirm the reservation situation here. For any questions, please contact "about Night experience" until full moon flowers (heartest@heartest.jp). 価格は税込み価格です。The price is tax-included price. We do not issue tickets. Please show us the information on order completion sent from here later when you visit us. 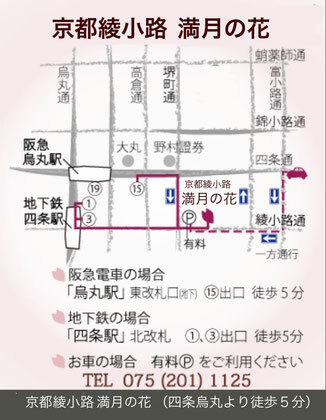 1.京町家で手まり寿司と京料理体験の所要時間･料金について About the time required for"Temarisushi and Kyoto Cuisine experience"
Payment method is card payment at stripe. Cancellation fee will be charged from the 5th day onward from the day before the reservation. 2.京町家でおばんざい作り体験の所要時間･料金について About the time required for"Obanzai cooking(Kyoto home cooking)experience"